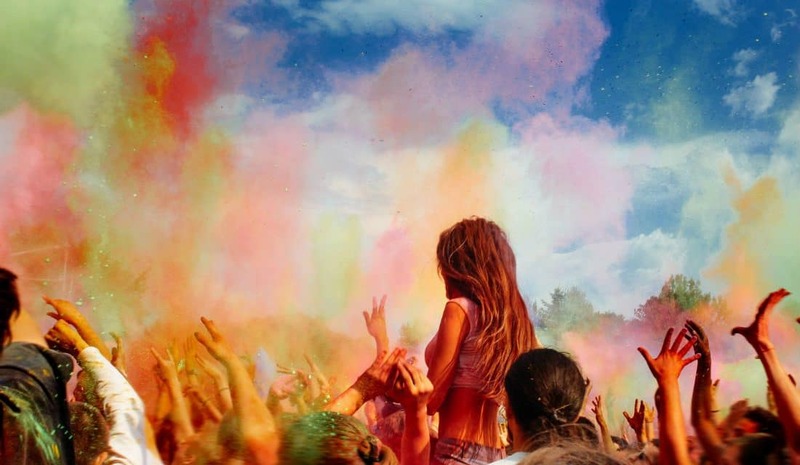 Holi, the Festival of Colours, is celebrated all across the country with great fervour. This festival is a celebration of the victory of good over evil and the arrival of spring. It is one of the most popular festivals in India. In fact, these celebrations are as varied as this multi-cultural country of ours. 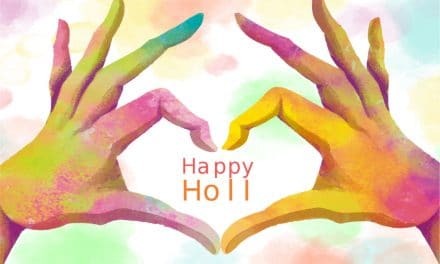 If you want to experience Holi in India then it all depends on how would you wish to experience this festival of colours. So, hold your breath as we take you on tour of the various cities of India where Holi is celebrated in its unique style. 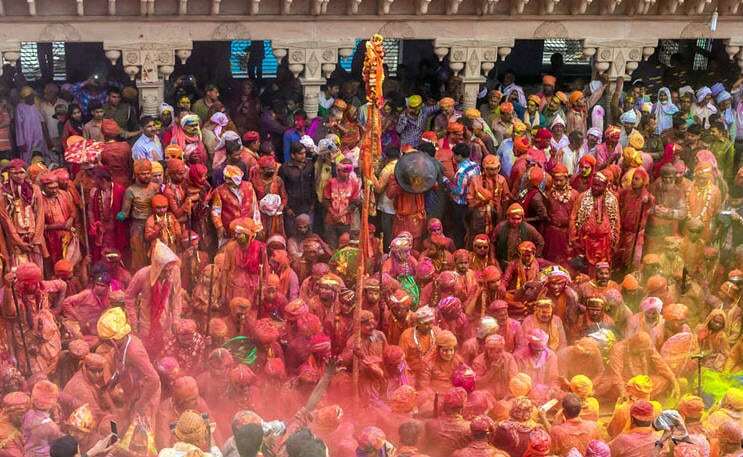 Holi celebrations of the ancient region of Braj have a historical significance. This region which now covers the cities of Mathura(where Lord Krishna was born) and Vrindavan(where Lord Krishna was brought up). According to an ancient legend, one day Lord Krishna complained to his mother and asked her why he was so dark while Radha was so fair. So Yashoda suggested that he should cover Radha in colours. This is how the colourful celebrations of Holi started. The Banke-Bihari temple in the holy town of Vrindavan has week-long celebrations during Holi. Here Holi is played with coloured water and gulaal, with the chanting of bhajans in the background. In Mathura, the best place to catch the excitement of the Holi celebrations is the Dwarkadheesh Temple. Holi celebrations in these two towns start a week before the actual festival. According to a legend, Nandgaon is Krishan’s birthplace while Barsana is Radha’s village. Traditionally men from Nandgaon go to Barsana so that they can celebrate Holi with the women there. These women welcome them by beating them with lathis(sticks). The men come prepared with shields in their hands. 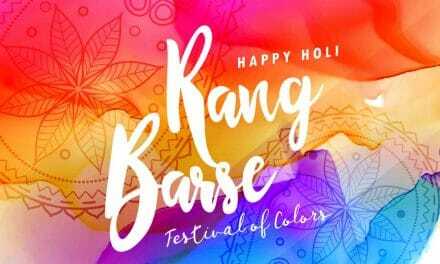 This celebration is also called Lathmaar Holi. The next day women from Barsana(actually men dressed as women) visit Nandgaon to celebrate Holi with the men there. The main event takes place in the courtyard of the temple in Nandgaon. Holi is celebrated with gracefulness as Basant Utsav on full moon day of Falgun in Shantiniketan. Nobel Laureate Rabindranath Tagore first started this tradition. The celebrations begin with dance followed by Tagore’s music and dance by students of different departments at Visva Bharati. The students at the University dress up in shades of yellow. Later, the students and the teachers apply abeer(colour) on each other. Visitors are also welcome during these celebrations. The celebrations end with a presentation of a selected dance drama of Tagore by the students of Sangit Bhavana. A three-day Basant Utsav is organised by the villagers in the Purulia district of West Bengal during Holi. The place is around five or six hours away from Kolkata and accommodation is provided in tents. The celebrations include traditional folk dance performances like Chau Dance, Darbari Jhumar, Natua dance and songs by Baul musicians. This festival attracts a lot of tourists during Holi and is an excellent initiative by the villagers to sustain themselves. The Sikh community celebrates Holi in their unique manner at Anandpur Sahib, Punjab. The tradition dates back to the time of the tenth Guru, Guru Gobind Singh Ji. He decided that the festival should be celebrated by displaying the martial spirit of his people and he gave the festival the name Holla Mohalla. The festival is famous for the fantastic display of martial arts by Nihangs. Mock battles, music and poetry are also a part of the celebrations here. The festivities begin with the morning prayers at the gurudwara. Langars are also organised by the local people here. Holi is celebrated in true royal style in Udaipur, Rajasthan. The celebrations begin with a grand procession of the royal band, beautifully decorated horses and more. The procession starts from the residence of the royal family of Mewar and ends at Manek Chowk at City Palace. The evening events include Holika Dahan. Folk dances, songs, dances and fireworks mark the royal celebrations at Udaipur. Shigmo or Shigmotsav is celebrated from the 9th moon day to the full moon day in Phalguna month. It is the most popular and the most significant Hindu festival here. Parades are organised during the last five days of Shigmo. People the dress up in colourful outfits and dance and sing different folk songs in the temple courtyard. Day five of the festival is called Rang Panchami, and people celebrate it by throwing gulaal on each other. Though Holi is a north Indian festival, Hampi in Karnataka is an exception. At Hampi, one of the top heritage sites in India, Holi is celebrated in grand style. Here, Holi celebrations last for two days. People in this old capital of Vijayanagara Dynasty dance and put colour on each other. The celebrations usually end with people bathing in the Tungabhadra River. 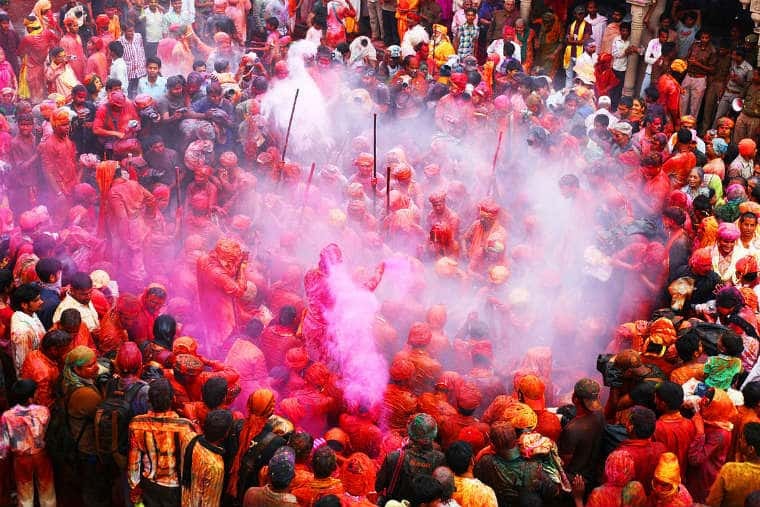 Many foreigners also participate in the Holi festivities here as this place is a popular backpacker destination. Thanks to so many beautiful options, choosing the best destination for that perfect Holi getaway in India will be a tough task. So, go on and select the option best suited for you and your family to have a fabulous Holi in India. 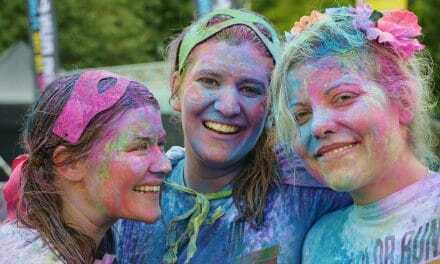 NextHow to Make Organic & Eco Friendly Holi Colours at Home? 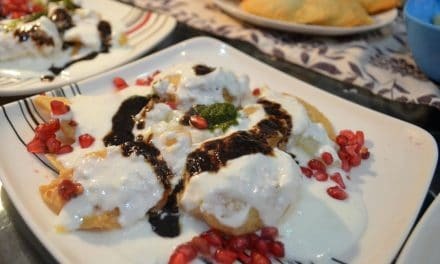 How to Make Organic & Eco Friendly Holi Colours at Home?